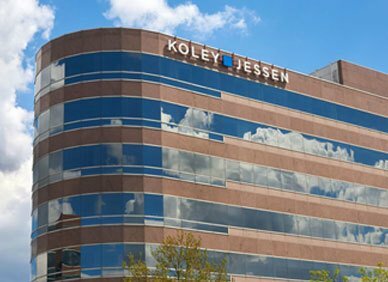 Koley Jessen was founded in 1988 when Jim Koley, Paul Jessen, and four additional partners set out to establish a firm focused on being a great place to work and providing over-the-top client service. The guiding principles of the firm’s culture: integrity, mutual respect, and client service, were what truly charted the firm’s path for future success. Working in a make-shift office while the firm got off the ground, Paul and Jim provided leadership and set a high standard for quality work. The initial focuses of the firm were on estate and business succession planning and corporate and transactional work. It wasn’t long before Koley Jessen moved from a location in the Old Mill to occupy the 8th floor at One Pacific Place. In addition to the move, a strategic business plan was at the forefront of discussion. In order to better serve clients, it was clear that the firm needed to specialize and expand its service offerings. As a result, our founders developed a matrix to identify hiring needs. Over the next ten years, Koley Jessen strategically and deliberately hired both experienced and new attorneys, one by one, checking client needs off of their matrix, until the firm grew to 20 lawyers. Since that pivotal expansion, we have continued to grow organically, each hire carefully planned, with firm culture and client service in mind. By 2008, the firm employed more than 50 attorneys and nearly 100 total people. Sadly, we lost Paul Jessen and Jim Koley, both to cancer in 2012 and 2013. These losses were heartbreaking for the firm, but we knew how they would want us to move forward and continue their legacy. Today, with over 75 attorneys and 136 total employees, Koley Jessen occupies three floors of newly renovated space at One Pacific Place. We are lucky to call Omaha our home. Our location allows us to serve an impressive and ever-growing base of local, regional, and national clients. Our full-service platform allows us to serve clients who have diverse legal needs and who desire and deserve over-the-top service. At 30 years old, we are proud of how we have grown and our achievements; however, even more important to us is our culture and strong commitment to client service that has remained since inception.